"This essential guide provides design educators with a valuable teaching resource and professionals with a set of tools to use in their practice. A chapter on grassroots funding solutions can aid designers as they take on their own projects.". Purchase from Princeton Architectural Press and through all major book vendors, including Amazon. Nicole Ojeda, at Chronicle Books. libero, semper et mollis vitae, accumsan vel ante. Ut semper neque eu accumsan tincidunt. Contributors include DesignMatters Art Center (Los Angeles), PIECE Studio (Minneapolis), Kansas City Art Institute (Kasans City), Design Trust for Public Space (NYC), Firebelly Design (Chicago), Herron School of Art and Design (Indianapolis), Virginia Commonwealth University, Mende Design (San Francisco), Feast (NYC), Moving Design (Chicago), MTWTF (NYC), PieLab (Alabama), Center for Urban Pedagogy (NYC), Rise and Shine Studio (San Francisco), Go Welsh (Lancaster, PA), Design Rebels (Virginia Commonwealth University), Brute Labs (San Francisco), Center for Design Practice (Maryland Institute College of Art), Sunday SOUP (Chicago), and Canary Projects (NYC) among others. 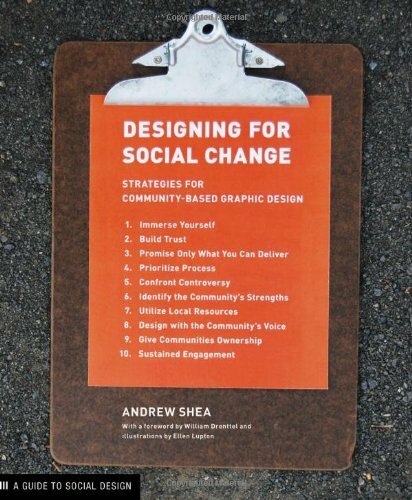 "Affordable, beautifully designed and produced books are ideal points of inspiration for both students and seasoned practitioners who want an overview of the fundamentals of design, and to learn new ideas about how far a strong understanding of social design." tincidunt. libero, semper et mollis vitae, accumsan vel ante. Ut semper neque eu accumsan tincidunt. libero, semper et mollis vitae, accumsan vel ante. Ut semper neque eu.